The G-1000 comes with a starter assortment of blades. It operates on 110 volts. Unlike other groovers, this deluxe groover is instantly hot. You don't have to wait for it to heat up to begin grooving. When you plug the G-1000 in, it instantly heats to the setting on the dial, which has adjustable heat settings 1 through 4. The G-1000 now has a HI/LOW switch, which creates 8 power options, enabling a perfect match between the power needed and the groove being cut. This kit is great for numerous applications including race car tires, truck tires, motorcycle tires, karting tires, ATV tires, industrial tires, etc. Essentially, this groover is your easiest and most accurate choice for any tire grooving application. Designed to be fast, smooth, & easy. Glides over the tire surface. Gives a precise, consistent cutting depth; virtually automatic. Cuts with less heat than most groovers, which prevents heat degradation to race tire surface. Instant blade change & adjustment. 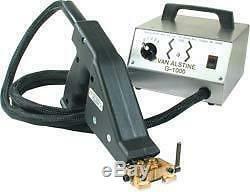 The Van Alstine G-1000 is designed to meet the exacting demands of modern tire grooving. Its ease of use makes it possible for anyone to cut quickly & accurately. The patented design of the G-1000 offers many advantages. The instant blade change & adjustment feature is critical for proper grooving. This enables the operator to easily position or re-position the blade at the correct depth & is particularly advantageous when different sizes blades are required on the same tire. By preventing the blade holding mechanism from contacting the tire surface, the unique suspended head design of the G-1000 nearly eliminates the deteriorating effects of the tire dirt on the electrical efficiency of the tool. Unlike other groovers, where a very hot portion of the tool makes direct contact with the tire surface, only the heated blade touches the tire with the G-1000 system. This helps to prevent heat degradation of the rubber. The elimination of heat degradation is extremely important with race tires because the new edges created by cutting grooves need to be as durable as possible. The patented design of the G-1000 uses the pushing force applied by the operator to virtually lock the tool at the proper cutting angle, making it effortless to maintain an accurate and consistent depth of cut. The smooth cutting action of the G-1000 allows the operator to easily follow or reproduce existing tread patterns with unparalleled control. The blade holding mechanism of the G-1000 is designed to protect the cutting edge of the blade, unlike other less convenient blade holders that actually damage the cutting edge by clamping directly on it. The Van Alstine G-1000 Deluxe Grooves comes with all parts necessary to begin grooving, as well as a starter assortment of blades including. 2 - #4 Blades, 1/8 Wide. 2 - #6 Blades, 3/16 Wide. 2 - #8 Blades, 1/4 Wide. 2 - #10 Blades, 5/16 Wide. The Van Alstine Electric Tire Siper. Thousands of other High Performance Parts. We want you to have the parts as bad as you do. The item "VAN ALSTINE TIRE GROOVER, GROOVING IRON, LATE MODEL, MODIFIED, UMP, IMCA, USMTS, DIRT" is in sale since Wednesday, October 10, 2012. This item is in the category "eBay Motors\Parts & Accessories\Car & Truck Parts\Wheels, Tires & Parts\Tire Accessories". The seller is "kratter" and is located in High Performance Parts. This item can be shipped to United States.